Nothing harshes a good mellow like sick buds. Thankfully, there may one day be an app for that. Hidden from the hazy Friday afternoon of Las Vegas, tucked away in the basement of the Flamingo casino, a group of likeminded hackers and security researchers gathered to explore “DIY cannabis tech” at DEF CON’s Cannabis Village. One researcher in particular, Harry Moreno, told the rather laid-back crowd that he believed that machine learning could one day solve a huge problem for home-grow enthusiasts: determining whether or not, and in what capacity, a marijuana plant is sick. There are plenty of ways to manipulate photos to make you look better, remove red eye or lens flare, and so on. But so far the blink has proven a tenacious opponent of good snapshots. That may change with research from Facebook that replaces closed eyes with open ones in a remarkably convincing manner. It’s far from the only example of intelligent “in-painting,” as the technique is called when a program fills in a space with what it thinks belongs there. Adobe in particular has made good use of it with its “context-aware fill,” allowing users to seamlessly replace undesired features, for example a protruding branch or a cloud, with a pretty good guess at what would be there if it weren’t. But some features are beyond the tools’ capacity to replace, one of which is eyes. Their detailed and highly variable nature make it particularly difficult for a system to change or create them realistically. Facebook, which probably has more pictures of people blinking than any other entity in history, decided to take a crack at this problem. It does so with a Generative Adversarial Network, essentially a machine learning system that tries to fool itself into thinking its creations are real. 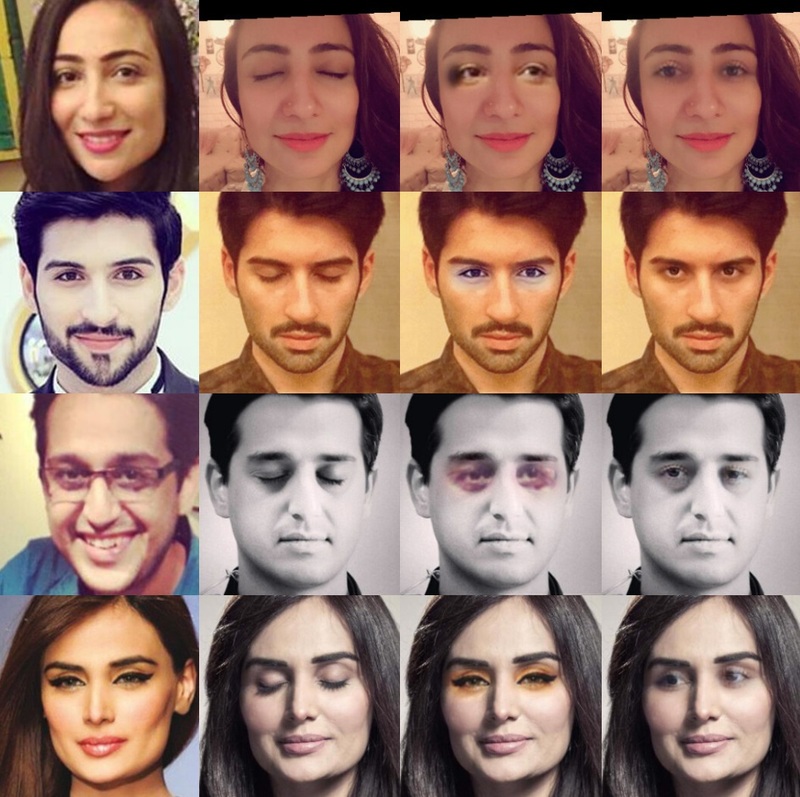 In a GAN, one part of the system learns to recognize, say, faces, and another part of the system repeatedly creates images that, based on feedback from the recognition part, gradually grow in realism. From left to right: “Exemplar” images, source images, Photoshop’s eye-opening algorithm, and Facebook’s method. 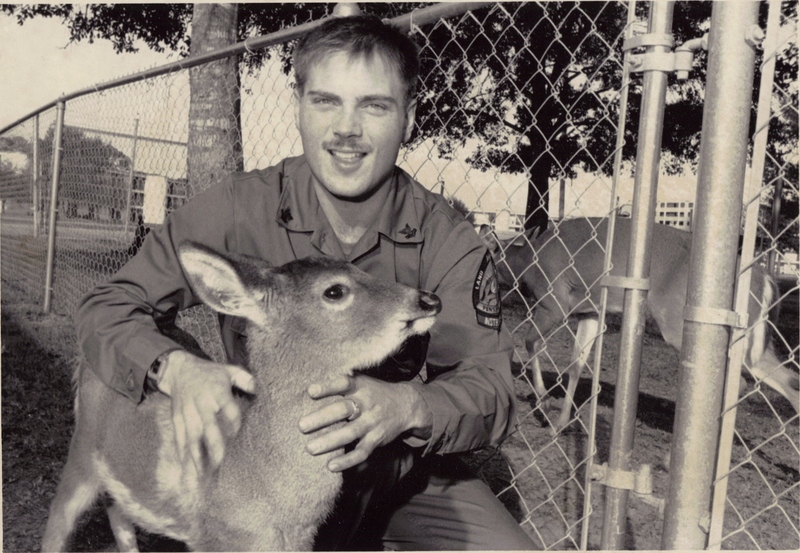 In this case the network is trained to both recognize and replicate convincing open eyes. This could be done already, but as you can see in the examples at right, existing methods left something to be desired. They seem to paste in the eyes of the people without much consideration for consistency with the rest of the image. What Facebook’s researchers did was to include “exemplar” data showing the target person with their eyes open, from which the GAN learns not just what eyes should go on the person, but how the eyes of this particular person are shaped, colored, and so on. The results are quite realistic: there’s no color mismatch or obvious stitching because the recognition part of the network knows that that’s not how the person looks. In testing, people mistook the fake eyes-opened photos for real ones, or said they couldn’t be sure which was which, more than half the time. And unless I knew a photo was definitely tampered with, I probably wouldn’t notice if I was scrolling past it in my newsfeed. Gandhi looks a little weird, though. It still fails in some situations, creating weird artifacts if a person’s eye is partially covered by a lock of hair, or sometimes failing to recreate the color correctly. But those are fixable problems. You can imagine the usefulness of an automatic eye-opening utility on Facebook that checks a person’s other photos and uses them as reference to replace a blink in the latest one. It would be a little creepy, but that’s pretty standard for Facebook, and at least it might save a group photo or two. 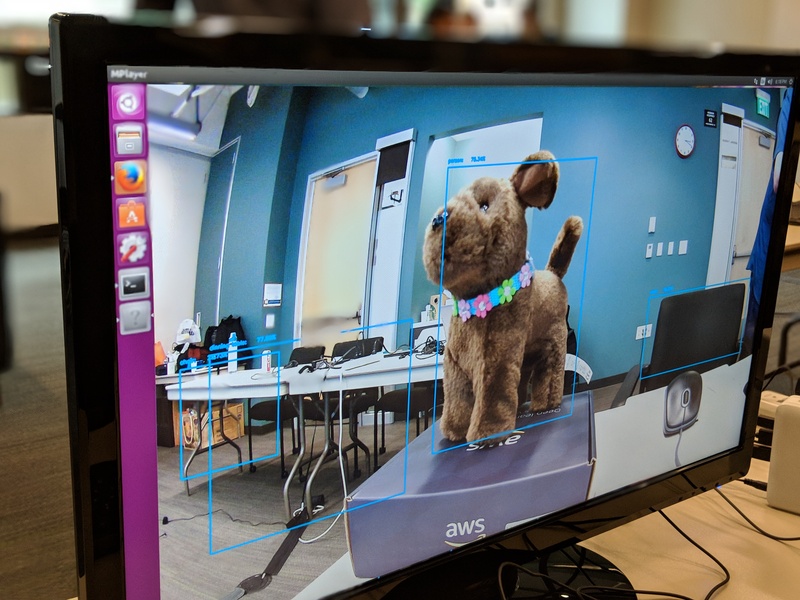 Back at its re:Invent conference in November, AWS announced its $249 DeepLens, a camera that’s specifically geared toward developers who want to build and prototype vision-centric machine learning models. The company started taking pre-orders for DeepLens a few months ago, but now the camera is actually shipping to developers. Ahead of today’s launch, I had a chance to attend a workshop in Seattle with DeepLens senior product manager Jyothi Nookula and Amazon’s VP for AI Swami Sivasubramanian to get some hands-on time with the hardware and the software services that make it tick. DeepLens is essentially a small Ubuntu- and Intel Atom-based computer with a built-in camera that’s powerful enough to easily run and evaluate visual machine learning models. In total, DeepLens offers about 106 GFLOPS of performance. The hardware has all of the usual I/O ports (think Micro HDMI, USB 2.0, Audio out, etc.) to let you create prototype applications, no matter whether those are simple toy apps that send you an alert when the camera detects a bear in your backyard or an industrial application that keeps an eye on a conveyor belt in your factory. The 4 megapixel camera isn’t going to win any prizes, but it’s perfectly adequate for most use cases. Unsurprisingly, DeepLens is deeply integrated with the rest of AWS’s services. Those include the AWS IoT service Greengrass, which you use to deploy models to DeepLens, for example, but also SageMaker, Amazon’s newest tool for building machine learning models. These integrations are also what makes getting started with the camera pretty easy. Indeed, if all you want to do is run one of the pre-built samples that AWS provides, it shouldn’t take you more than 10 minutes to set up your DeepLens and deploy one of these models to the camera. Those project templates include an object detection model that can distinguish between 20 objects (though it had some issues with toy dogs, as you can see in the image above), a style transfer example to render the camera image in the style of van Gogh, a face detection model and a model that can distinguish between cats and dogs and one that can recognize about 30 different actions (like playing guitar, for example). The DeepLens team is also adding a model for tracking head poses. Oh, and there’s also a hot dog detection model. But that’s obviously just the beginning. As the DeepLens team stressed during our workshop, even developers who have never worked with machine learning can take the existing templates and easily extend them. In part, that’s due to the fact that a DeepLens project consists of two parts: the model and a Lambda function that runs instances of the model and lets you perform actions based on the model’s output. And with SageMaker, AWS now offers a tool that also makes it easy to build models without having to manage the underlying infrastructure. You could do a lot of the development on the DeepLens hardware itself, given that it is essentially a small computer, though you’re probably better off using a more powerful machine and then deploying to DeepLens using the AWS Console. If you really wanted to, you could use DeepLens as a low-powered desktop machine as it comes with Ubuntu 16.04 pre-installed. For developers who know their way around machine learning frameworks, DeepLens makes it easy to import models from virtually all the popular tools, including Caffe, TensorFlow, MXNet and others. It’s worth noting that the AWS team also built a model optimizer for MXNet models that allows them to run more efficiently on the DeepLens device. So if you want to get started with deep learning and build some hands-on projects, DeepLens is now available on Amazon. At $249, it’s not cheap, but if you are already using AWS — and maybe even use Lambda already — it’s probably the easiest way to get started with building these kind of machine learning-powered applications. IBM’s Watson Studio is the company’s service for building machine learning workflows and training models, is getting a new addition today with the launch of Deep Learning as a Service (DLaaS). The general idea here, which is similar to that of competing services, is to enabled a wider range of businesses to make user of recent advances in machine learning by lowering the barrier of entry. With these new tools, developers can develop their models with the same open source frameworks they are likely already using (think TensorFlow, Caffe, PyTorch, Keras etc.). Indeed, IBM’s new service essentially offers these tools as cloud-native services and developers can use a standard Rest API to train their models with the resources they want — or within the budget they have. For this service, which offers both a command-line interface, Python library or interactive user interface, that means developers get the option to choose between different Nvidia GPUs, for example. The idea of a managed environment for deep learning isn’t necessarily new, With the Azure ML Studio, Microsoft offers a highly graphical experience for building ML models, too, after all. IBM argues that its service offers a number of distinct advantages, though. Among other things, the service offers a drag-and-drop neural network builder that allows even non-programmers to configure and design their neural networks. In addition, IBM’s tools will also automatically tune hyperparameters for its users. That’s traditionally a rather time-consuming processes when done by hand and something that sits somewhere between art and science. It’s hard to fathom that the work of Reverend Thomas Bayes is still coming back to drive cutting edge advancements in AI, but that’s exactly what’s happening. DARPA-backed Gamalon is the latest carrier of the Bayesian baton, launching today with a solution to help enterprises better manage their gnarly unstructured data.